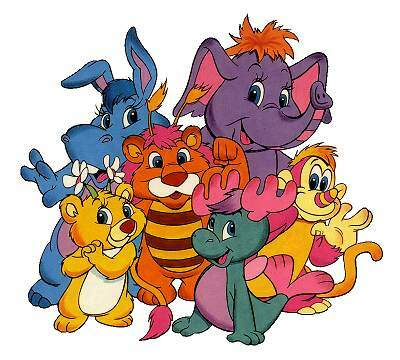 One of the first animated television series to come out of Disney for its burgeoning studio dedicated to such programming (the other being Adventures of the Gummi Bears), The Wuzzles was the brainchild of Disney CEO Michael Eisner to capitalize on the success of the Care Bears. The series featured the Isle of Wuz where beings known as Wuzzles lived. Animal hybrids, some of its more notable members were Bumblelion (bumblebee/lion), Butterbear (butterfly/bear), Eleroo (elephant/kangaroo), Moosel (moose/seal), Hoppopotamus (rabbit/hippopotamus), and Rhinokey (rhinoceros/monkey) who often had conflict with Crock (crocodile/dinosaur) and his minions Brat (boar/dragon) and Flizard (frog/lizard). However, not only were the Wuzzles hybrids on the Isle of Wuz, everything was a hybrid as its residents ate appleberries and spoke on telephonographs. Sadly, the series was one of the few failures of the early products from the Disney television animation studio lasting only thirteen episodes but which lived long after in re-runs and through its significant merchandise. 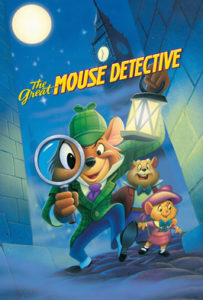 Based on the children’s book series Basil of Baker Street (1958), The Great Mouse Detective (1986) featured Basil, a mouse living in Victorian England who lived in the same building as the great detective Sherlock Holmes of whom Basil emulated to be his contemporary of the animal world. Joined by Dr. David Q. Dawson, Basil sought to bring to justice the evil Professor Ratigan whose final scheme saw him try to assassinate Queen Mousetoria in order to rule England. The moderate success of Great Mouse Detective following the commercial failure of previous animated feature The Black Cauldron (1985) saved the animated film division from being shut down. The cousin of Donald Duck and farmhand for Grandma Duck (Donald and Gladstone Gander’s grandmother), Gus Goose first appeared in Donald’s Cousin Gus (1939) where he visits Donald and eats him out of house and home making the agitated fowl desperate to be rid of his guest. 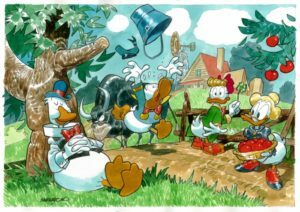 In the comics, Gus was featured in stories in which Donald visited his grandmother on her farm just outside of Duckburg. Bitter rival of Gyro Gearloose, Emil Eagle, while brilliant, paled in comparison to Gearloose prompting his turn to instead steal from his contemporary. 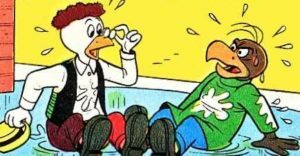 This lead Eagle down a life of crime coming into conflict with Mickey Mouse, Super Goof, and various others. Though, Eagle bears a number of similarities to DuckTales‘ Mark Beaks which might denote a connection. Undoubtedly, Goof Troop is in DuckTales‘ future. 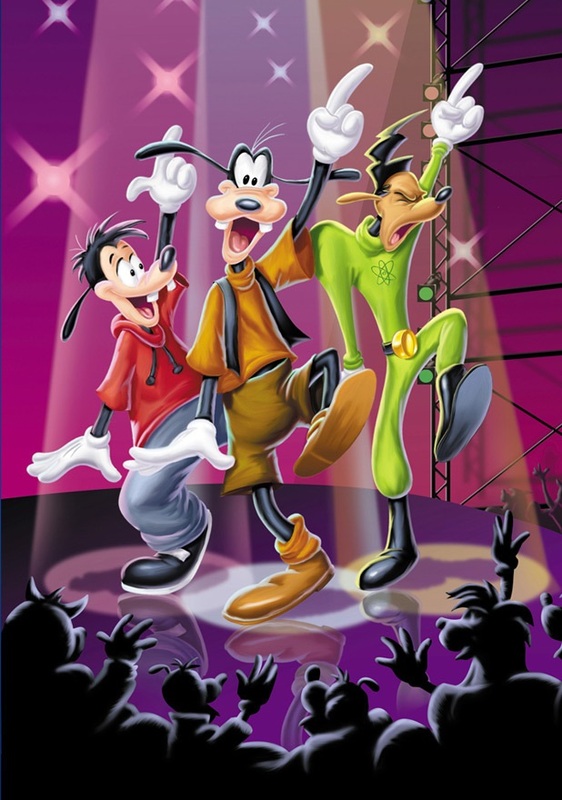 In the latter’s pilot episode, the setting of the former in Spoonerville is mentioned as co-producer Frank Angones has stated he wanted Dewey to have a poster of Powerline (a musical performer in 1995’s A Goofy Movie) in his room that was rejected by the higher-ups. 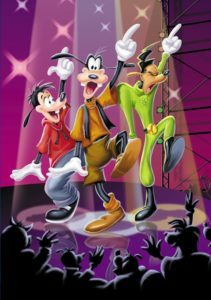 Featuring the lives of Goofy as a single father raising his son Max and Goofy’s neighbor/friend Pete and his family, Goof Troop ran for two seasons and was accompanied by two movies (which introduced Max’s crush Roxanne). 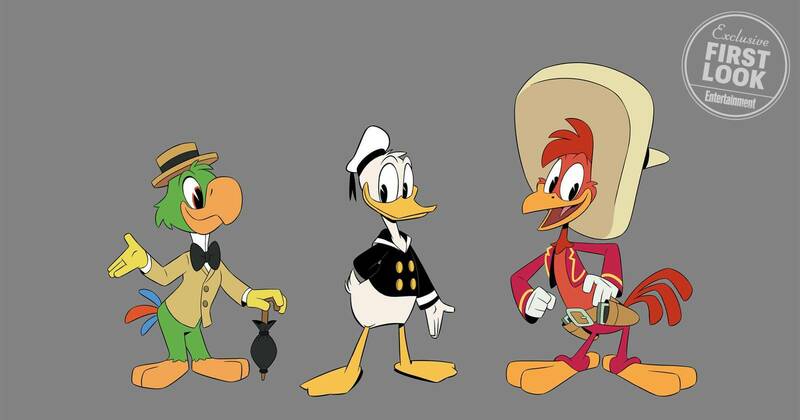 Given the interest in the show by DuckTales‘ showrunners, it’s likely as soon as Disney approves it, Goofy and friends will be coming to Duckburg. Coming six years after DuckTales, Quack Pack featured Huey, Dewey, and Louie as teenagers raised by their Uncle Donald. In the first episode of the series, the boys stumble upon Ludwig Von Drake’s Transformulator that turns them into superheroes. Taking the name the Tremendously Talented Trio of Truly Trusted Trouble-Shooters, or T-Squad for short, the boys take advantage of their powers to avoid harassment by their uncle. In response, Donald uses the Transformulator to become the Duck of Doom. 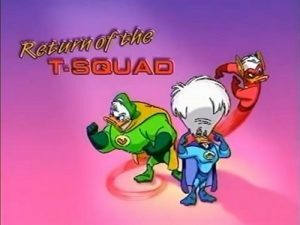 Henceforth, when the situation called for it, the boys became the T-Squad to protect the Earth. A costumed persona adopted by Donald Duck to get revenge on Scrooge McDuck and Gladstone Gander, the Duck Avenger later became a Batman-like hero combating the Beagle Boys and other villains in Duckburg like Inquinator. Later, the Duck Avenger took on his girlfriend Daisy as a partner in Super Daisy and later still Spike the Bee as a sidekick. Fethry Duck followed suit becoming Red Bat as his girlfriend became Purple Butterfly and his nephew Dugan as Red Bat Junior. When Goofy ate Super Goobers, he would take on Superman-like abilities and became Super Goof. In time, Duckburg developed a superhero team called the Ultraheroes made up of Duck Avenger, Super Daisy, Red Bat, and Super Goof who were joined by Scrooge McDuck as Masked Tophat, Gladstone Gander as Clover Leaf, and Gus Goose as Iron Gus. Following the success of Adventures of the Gummi Bears and DuckTales, Disney produced a fourth animated television series that was packaged with the latter for syndication in Chip ‘n Dale: Rescue Rangers. 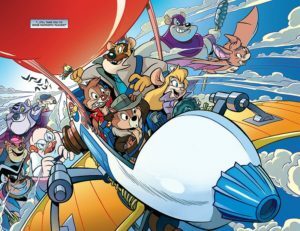 Featuring chipmunks Chip and Dale, the brothers form a detective agency with friends Monterrey Jack, Gadget, and Zipper. Chip and Dale’s redesign was based in part on Indiana Jones and Thomas Magnum, respectively, as the team found a nemesis in the villainous feline Fat Cat. Gummi Bears, DuckTales, and Rescue Rangers were packaged together with new series TaleSpin to form the original line-up for the programming block the Disney Afternoon. The show ran for three seasons with 65 episodes. Following the success of the Disney Afternoon’s first season, Adventures of the Gummi Bears was dropped and a new show was added to the line-up. 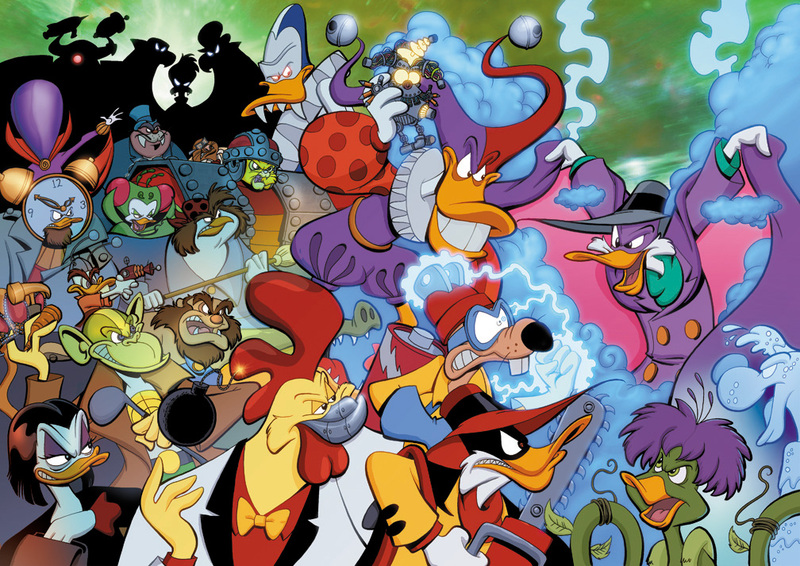 Originally called “Double-O Duck,” it was decided internally to shift from producing a spy series to a superhero show in what became Darkwing Duck. Featuring single father Drake Mallard raising his adopted daughter Gosalyn, when the various supervillains of St. Canard or super spies of F.O.W.L. threatened the world, Mallard would don the guise of Darkwing Duck to stop them. 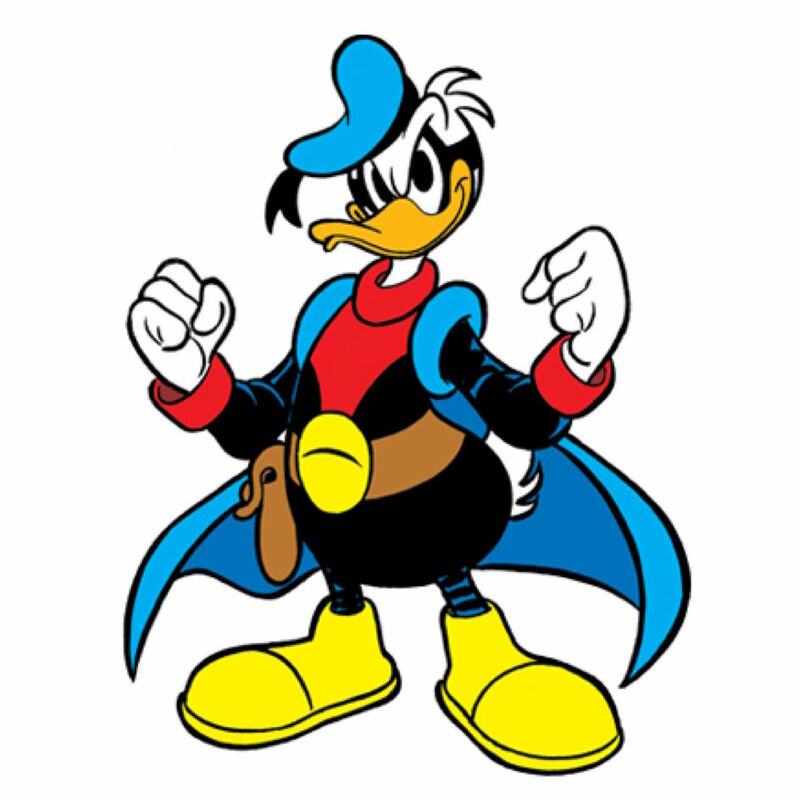 Several elements of the series have already permeated DuckTales as St. Canard was mentioned in the first episode, Darkwing Duck appeared as a television series within the series, and Scrooge McDuck and Bentina Beakley were agents of S.H.U.S.H. (the spy agency that employed Darkwing) tasked with stopping an agent of F.O.W.L. Interestingly enough, Ludwig Von Drake was the director of S.H.U.S.H. in DuckTales when McDuck and Beakley were members instead of J. Gander Hooter but the episode in question was a flashback to a number of years in the past. Arguably the most notable absence in DuckTales thus far is Daisy Duck. The longtime girlfriend of Donald Duck, Daisy is one of the most recognizable characters among the “Mickey Mouse & Friends” group much of the DuckTales series borrows from for the show. Daisy never appeared in the original DuckTales (considering Donald only made rare appearances), but she was an infrequent ally to Scrooge McDuck in the comics the series is based upon and was a featured character in the Quack Pack series. 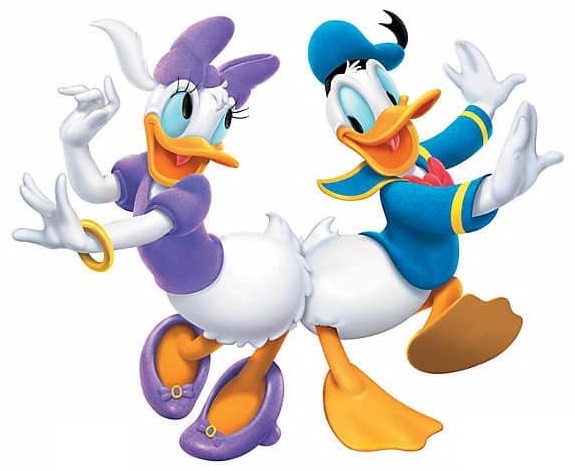 In the comics, it was revealed that Daisy’s brother is the father of Huey, Dewey, and Louie (which is why they refer to her as Aunt Daisy) as Donald’s twin sister Della is their mother. Considering the emphasis in the first season of revealing the secrets of Della, it then wouldn’t be surprising that the second season focus on the father who in the eight decades since he was first mentioned has never been named (simply referred to as ?). Honorable mentions: Chief Seamus O’Hara, Phantom Blot, Super Goof, Mighty Ducks, and The Rescuers. This entry was posted in Comics and tagged Disney, DuckTales, Jerry Whitworth. Bookmark the permalink.